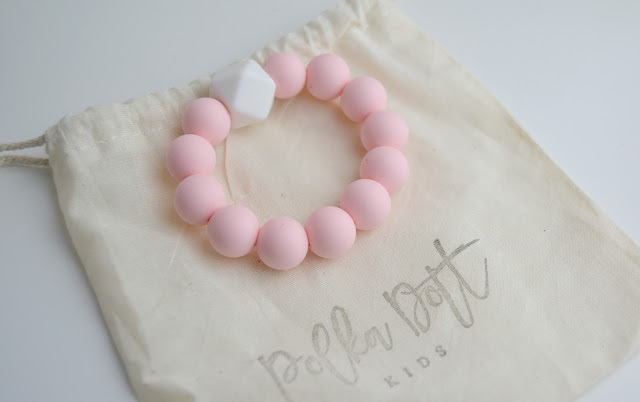 Polka Dott Kids recently reached out to us to see if we wanted to try out some teething toys for Harleigh. She is now 5 months old and very much teething. Ear rubbing and red cheeks are her main signs, just like Paige and Parker. 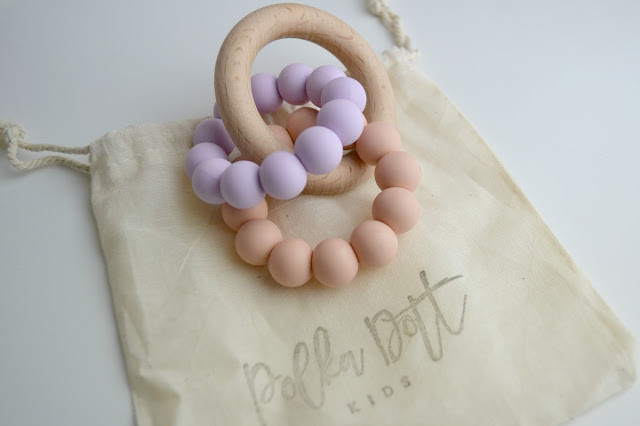 Polka Dott Kids have some gorgeous teething products which are inspired by minimalist Scandinavian design. They include lovely soft colours and luxurious textures. The teething toys combine style and functionality in a modern way that produces some lovely items. Each item is hand crafted with natural non-toxic materials which makes them completely safe for baby. We were sent the Jumbo Twin teething toy and the Geo teething toy. They both came gorgeously wrapped in tissue paper inside a cotton drawstring bag, perfect for out and about storage. Harleigh loves chewing on them both. 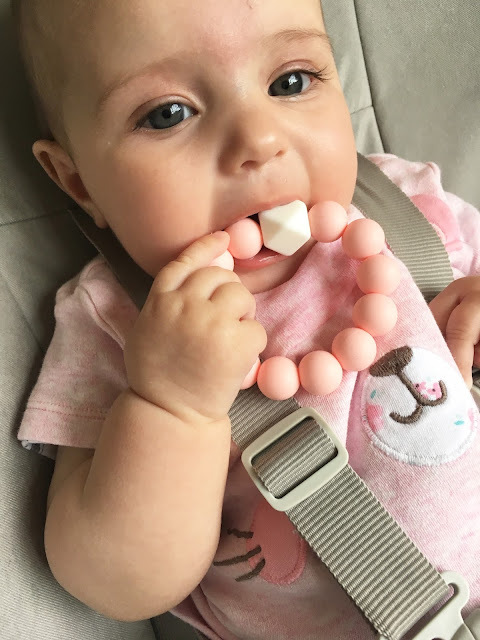 They both feature silicone beads and these are great for teething babies to chew on. They are food grade beads and are free from BPA, lead, cadmium, phthalates, PVC and latex. They don't adsorb odours or support the growth of mould, fungus or bacteria. They are very safe for baby and they love chewing on them. The large wood ring attached to the Jumbo Twin teether is made from beach wood which is non-toxic, non-splintering and have natural anti-bacterial properties. It is also treated with an organic blend of beeswax and coconut oil. Babies love have the two different textures to chew and hold. Sometimes Harleigh prefers the bead and other times she likes to chew the wood. I love the teethers because they are very natural and safe and look gorgeous. They would make a really lovely gift for a baby or expectant mum. Harleigh is doing well with teething at the moment and these teethers are really helping her. I'm excited to see when those first teeth will cut. 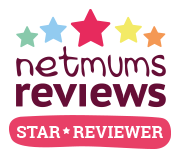 How did your little one do with teething?